Try some of these Kale Chip Recipes! Great technique and it’s easy! Deliciously chocolatey and banana flavored. And it’s great for you. Cook quinoa in almond milk. Add water if the texture becomes too thick. Take half of the banana and mash it with the hot quinoa. Lower heat. Add cinnamon and cocoa. Add agave to taste. Serve garnished with banana slices! Blend and enjoy! Add more soymilk if there is trouble blending. Easy, fast, and keeps you full for hours! Who doesn’t want that out of their brekky? Prepare oatmeal according to package directions. Stir in milk and peanut butter and honey. 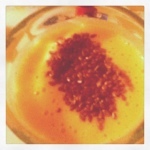 Top with chia seeds. Serve immediately. Veggies and cheese are the best combination. It’s a no carb version of an awesome dish. Let me know how you guys like it if you try it! Preheat oven to 375 degrees. Lightly spray a baking dish with Pam. An easy way to not soak your dish in Pam is to spray it on a paper towel and cover the glass pan that way. Layer the sliced steamed squash and zucchini in a layer. Doctor your marinara or red sauce with pepper and garlic. Add the plain greek yogurt. Pour the red sauce on top of the squash and zucchini layer. Add a thin layer of cottage cheese and the spinach or kale. Add another layer of the squash and zucchini. Repeat. On the top layer add the mozzarella on top for a brown crust. Add tomato slices on top for garnish if desired. Serve with a whole wheat baguette since you are saving carbs by not using the pasta for the lasagna. Or serve with a crisp mesclun salad with fresh cucumber and a rice vinegar dressing with tomatoes. Chop the firm tofu finely and add to kale. Add the pepper and the artichokes, the breadcrumbs and the egg, all mixing well as you go. Add parmesan. Add olive oil and work the mixture until it is all finely mixed. In a nonstick pan, spray with Pam, and shape mixture into patties.Fry one minute on each side until egg cooks through and keeps patty together. This may take some practice, but it is a great recipe to know because you can adapt it into so many different ways. Hey everyone! Another low carb dinner or lunch option! Hope you enjoy! I love how luscious avocado makes a dish. The richness of the avocado adds the best flavor. Shred the chicken with two forks and set aside. Mash the avocado with the juice of the lime and lemon. Add tomatoes and red onion and combine with the shredded chicken. Wash and halve the red bell peppers, remove the seeds and the stems. Spoon the avocado chicken mixture into the red bell pepper cups. I am on a smoothie kick my friends and this is my favorite after workout smoothie! I love the flavor of peanut butter and pineapple together! This smoothie is sweet so it satisfies those dessert cravings too! I cut out a lot of sugar in my life ever since I became serious about eating healthy. When I was in college, there was not easy access to a blender and I didn’t always have time to run back to my dorm after a gym session to repair my muscles properly. Oh beautiful muscles I am so sorry for what I have done these last four years. Anyway, those days are over and I read more and more about nutrition everyday. In a short amount of time, I have changed my eating habits and my body feels so much better. My skin looks better and I am getting much more sleep. The college lifestyle of friends and Wawa did not do me any favors. These changes take time and it wasn’t easy but I did not know how delicious nutritious foods can be. And how easy they are to access. This one promotes muscle growth because pineapple is a great after workout food, you should drink it within an hour of working out! Here you are my friends! Blend all together and enjoy! It should be frothy and fabulous! This is also great frozen in popsicle molds! I love green smoothies and so should you! You can barely taste any greens that you throw in and it is a great way to get your servings of fruits and veggies everyday! I have grown addicted to making new combinations and I try to try something new every morning. Smoothies are all blended so it is easier on your stomach to digest! 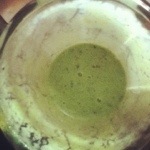 I try ot start my morning with a green smoothie everyday. This one is one of my favorite combinations and I keep coming back to it so I wanted to share it with all of you! Blend all ingredients together in a blender and add a couple tablespoons of filtered water if it does not lend smoothly! Healthy wishes and dishes loves!